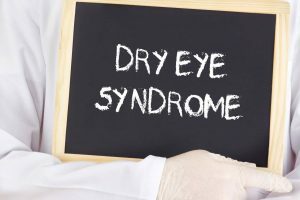 Dry eye syndrome (DES) is a chronic eye condition that develops when your eyes do not produce and maintain enough tears to keep the eye’s surface lubricated resulting in multiple symptoms that range from person to person. This can be due to a reduction in tear production or increased tear evaporation from a lack of lipid in the tears that stem from oil glands in the eyelids. The effects can range from minor dryness and discomfort, to pain, blurred vision and frequent infections. Typically, at our Kissimmee and Lakeland Eye Care Clinics, we are able to diagnose dry eye syndrome through a comprehensive eye exam and a description of your symptoms. On some occasions, Dr. Ciambrone might decide to do a test that measures how quickly your tears evaporate from the surface of your eye. By instilling a simple dye called fluorescein (much like food coloring) the doctor is able to watch and count how long it takes the tears to start to break up after they’ve asked you to hold your eyes open after a blink. This is called TBUT or a Tear Break Up Time test. A low TBUT generally indicates a lipid (aka oil) deficiency in the tears resulting from oil glands in the eyelids not functioning properly. In another type of test, called a Schirmer test, a strip of filter paper is placed under the lid of the eye and you will be asked to close your eye for five minutes. Following the test, the amount of moisture on the strip will be measured. Schirmer tests are performed less frequently than a TBUT test. At Ciambrone Vision, we offer many treatment options for dry eyes which are highly dependant upon the cause and severity of the condition. Many mild forms of Dry Eye can be alleviated using artificial tears or lubricant eye drops to make up for the lack of natural tears usually produced by your eyes. If over-the-counter drops don’t alleviate your symptoms, your doctor might prescribe prescription drops that actually stimulate tear production or steroids for short-term relief. If the cause of your dry eyes is something external or environmental, eliminating that cause may solve the problem and resolve the symptoms. Avoid dry environments, hairdryers, heaters and fans, (particularly directed toward the eyes) and smoky environments and wear eye protection such as wraparound glasses or goggles when in dusty or windy areas. Use a humidifier to add moisture to dry indoor air. If working on a computer or watching television, make sure to blink purposefully as our natural tendency is to reduce our blink rate when staring at a screen. Also, avoid rubbing your eyes as this can further irritate them. Staying hydrated by drinking at least 8 to 10 glasses of water per day can also help.